Last week, Massey University’s MATTER research cluster and Museum of New Zealand Te Papa Tongarewa held the ‘ Material Histories’ symposium that brought together historians, curators and a few keen amateur collectors. Participants were treated to a range of interesting speakers such as Beverly Lemire, University of Alberta and Founding Director of the Material Culture Institute who highlighted the histories of tobacco products and washing over the last few centuries. Indeed if anyone is looking for a project, Beverly suggested that there is an international history of laundry begging to be published. Local speakers Kate Hunter, Victoria University and Kirstie Ross, Te Papa outlined their current research into New Zealand’s World War I effort through examples of material culture. Objects such as soldier dolls and fragments of military uniforms serve as reminders of lost lives. In addition, a number of soldiers recovering from their injuries took up creative activities from basket making to embroidery. An example by soldier Fred Hansen can be viewed on Te Papa’s website at http://collections.tepapa.govt.nz/objectdetails.aspx?oid=864100. Indeed this apron caught the eye of Queen Mary who was keen to acquire it but according to family history, it had been promised to Fred’s mother and was not given to the Royal Family. Unfortunately I don’t have any examples of World War I objects but the following two pieces are examples of World War II pieces made by soldiers who were injuried in the conflict. 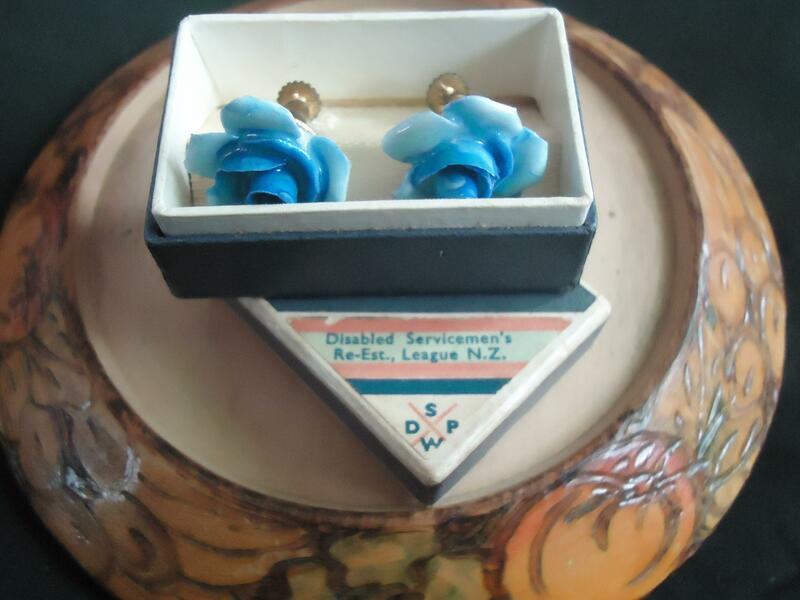 The earrings were purchased by my grandmother shortly after World War II and the decorated wooden object was a recent find. Freelance historian Bronwyn Dalley examined the popularity of historic material objects. From retro to cooking shows, granny-hunting to granny-chic, New Zealanders are keenly acquiring items from the past. During the course of her talk, Bronwyn introduced family pieces from linen table cloths to wooden cake stands that has been passed down the generations. Representing different eras, the family connection unifies them and shows how we engage with the personal and material past in both the real and digital worlds. 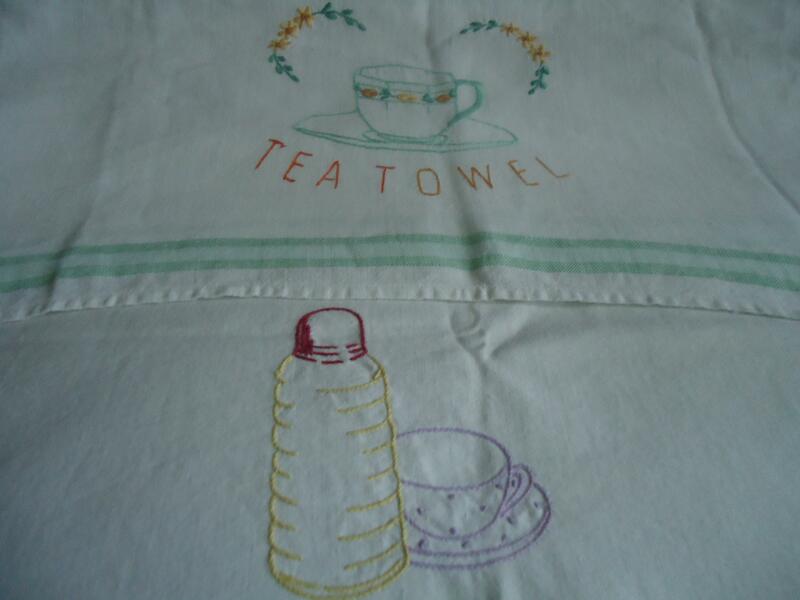 The following tea towels were purchased at a vintage fair the very next day confirming that the acquisition of historic material objects is a regular activity for many including myself. Another enjoyable session saw a panel of post-graduate students providing a brief overview of their research. Debbie Noon completed a MA thesis in the rise and rise of op shops. Debbie spoke of the many reasons for the increasing popularity of op shops – the chance to purchase unique items at affordable prices definitely resonated with me. Megan Watson’s MA thesis examined afternoon tea practices in the Manawatu region during the 1930s and 1950s. We learnt that there is difference between afternoon tea and Afternoon Tea (and it’s not just capitals). 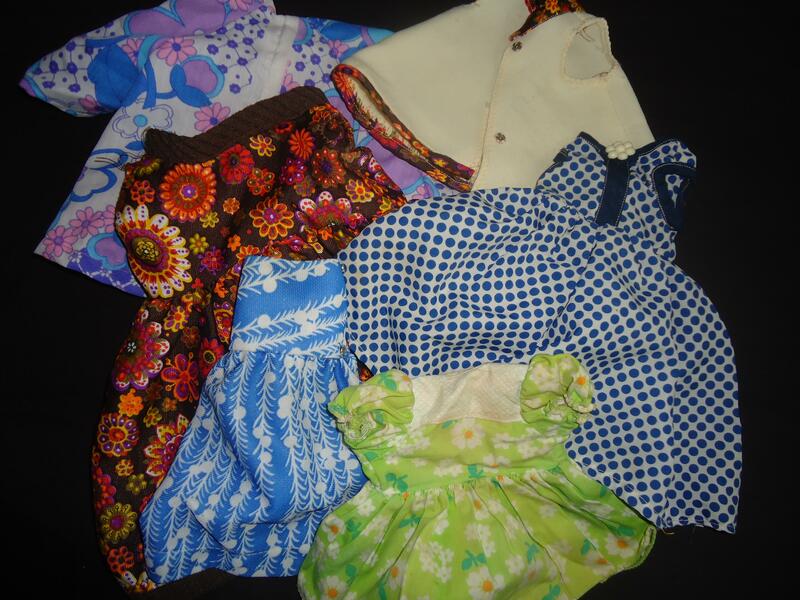 Dinah Vincent is embarking upon a PhD on the meanings of girls’ sewing in the 1950s and 1960s and provided a fascinating introduction to the school curriculum which promoted the role of girls as future wives and home makers. It will be interesting to see what information Dinah uncovers over the course of her research. 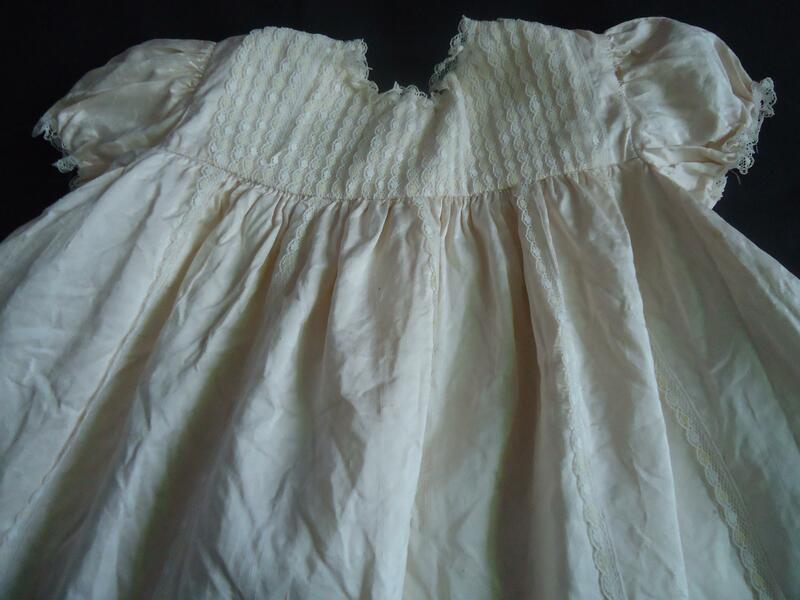 Certainly my family benefitted from my mother’s sewing skills which saw an array of dolls clothes made for us as well as christening gowns. You can also read more about this conference on a Te Ara blog at http://blog.teara.govt.nz/2012/11/21/sad-stories-and-slightly-creepy-dolls/ and thanks to the organisers for a lively and affordable symposium. As I run around the op shops tomorrow, I now feel that I’m participating in the world of history as well as feeding my less noble consumerism habits.